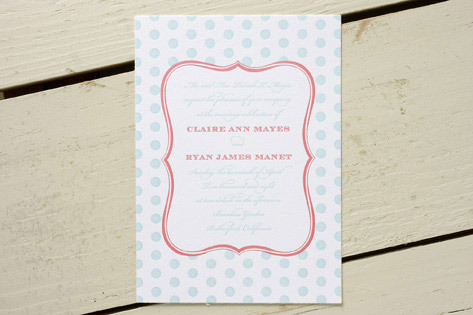 Lighthearted polka dots and a beveled frame create an air of fun and whimsy in this retro style wedding invitation suite. Additional options include a die cut RSVP card, and the invitations are printed on Crane Lettra paper in fluorescent white. Available in pool/cardinal (shown), kelly/heliotrope, cocoa/celadon, and sky. Fonts shown are Engravers Shaded and Bickham.